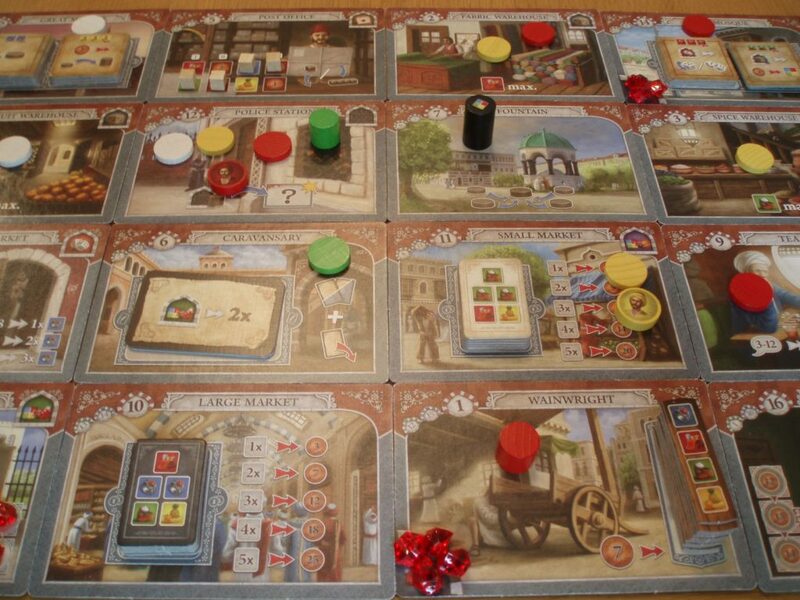 I think Istanbul is a fantastic game: it’s an interesting and interactive puzzle, has a lovely pace and an engaging theme. It also looks good on the table, the various locations spread out before you in a grid of potential. And it’s such a tactile experience, dropping and collecting apprentices like stacks of chips at a casino. It’s great, a justifiable Spiel des Jahres winner. 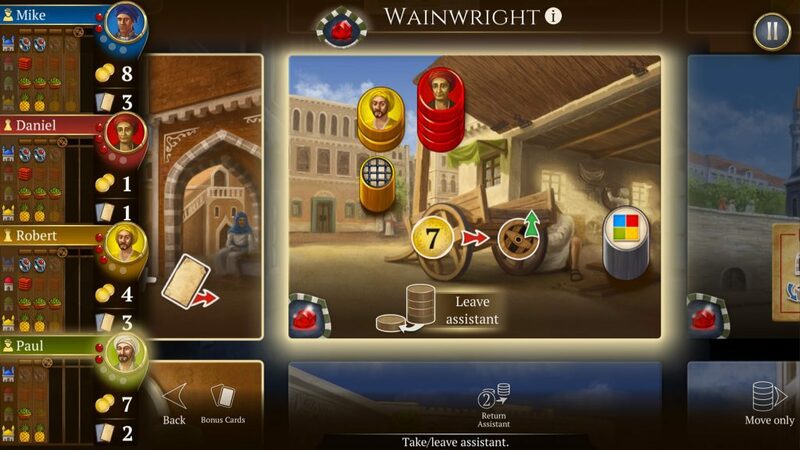 So I was intrigued when I learnt that Istanbul was coming to the app store – how would it fare with a digital adaptation? I’m not going to go into detail about the gameplay itself (check out my earlier Istanbul review for that). 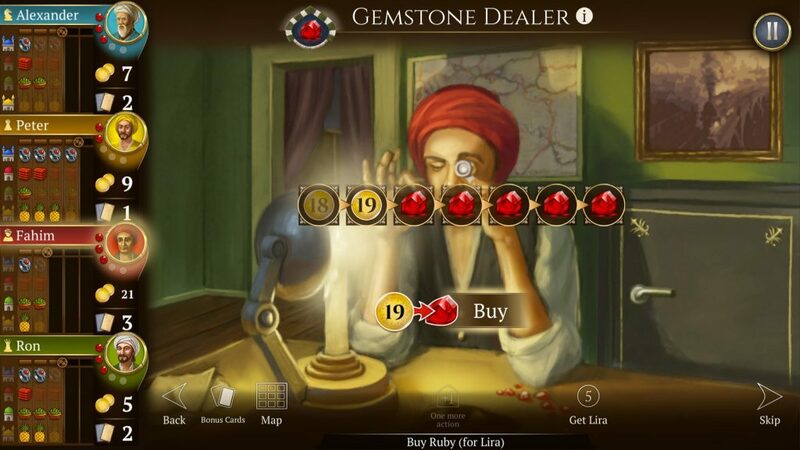 A quick overview is that 2-5 players are merchants navigating a busy bazaar in Istanbul, trading goods and money in a quest to be the first to claim 5 rubies. 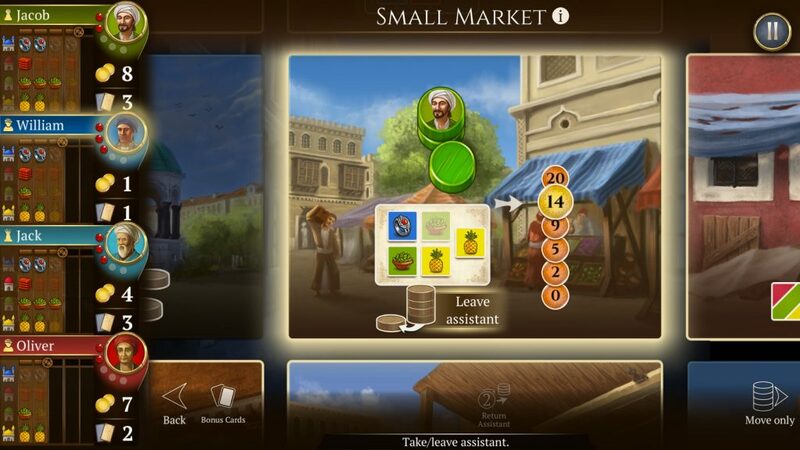 Players race around the market, pushing wheelbarrows filled to the brim with produce and chivvying their apprentices along with them. So what’s it like on the app? I’ll confess I had some reservations. There’s a fair amount of visual information to keep track of: the market is made up of 16 different locations, there are multiple player and non-player pieces and it’s important to pay attention to what your opponents have and where they might be going next. Would the conversion to an app be able to handle it? There’s a lot of visual information to condense. Broadly I’d say Acram Digital have managed it. I’ve been using a smartphone with a 5.1 inch screen to test the app. It’s pretty large for a smartphone, but still, it’s not exactly huge. The shrinking process, from cardboard to pixel, is a success. It helps that Istanbul’s iconography is clear and crisp. In particular the different goods in the game really stand out due to their bright primary colours (although if you struggle to discriminate between colours then the shrunken icons for each type of good are a bit trickier to identify). You can zoom into areas of the board to make it easier to see but, to be honest, I’ve not really needed to. In a curious thematic decision the designers have set the backgrounds to the game at night, an overall tone that makes the game feel a little gloomy. I can see the logic – with a darker background the daytime market locations stand out that bit more – but it does move a little too far away from the lighter tones of the physical game. It’s also fairly easy to see what your opponents are up to. The wheelbarrows of the physical game are placed in a bar on the left so it’s easy to quickly assess what goods they’ve got and where they might be going. That said, I’ve still struggled to keep track of everything on occasion. Losing the three-dimensional aspect of the physical games makes it slower to scan the board and see what’s happening around the market. The market locations and wheelbarrows (on the left) are easy to identify. I’ll confess I don’t have much of a clue about Turkish music but the music feels in keeping with what little I know. The locations have their own sound effects when you visit them as well, each linked to the action of the location. It was a lovely surprise when I turned the sound on and suddenly the game felt more immersive. It’s not too much either; sometimes sounds and music can get irritating but I’ve yet to find that to be the case. It’s a little detail that improves the experience ten-fold. For new players Acram Digital have done a fantastic job at making the learning process as smooth as possible. The tutorial feels very well put together and easy to follow. Helpful info bubbles are found on pretty much everything in the game, subtle additions that if clicked on expand to help the unsure player. I would imagine it’s still a bit overwhelming for the new player but I’m not too sure that there’s much Acram Digital could have done – Istanbul, for all its ease of play, is still a medium-weight game. The blue player’s options are highlighted for clarity. Another couple of features provide further help. Firstly, every space you can legally move to is highlighted for you. It’s a simple addition that just helps to make the process easier for the new player. Secondly, the app has a replay function. Click the replay button and the pieces will slide across the screen, re-enacting the previous round of turns. For a game that depends on players planning out routes in advance it’s an inspired addition. It’s also automatic when you reopen the app, refreshing your memory of what you and your opponents were doing last time you played. Pass-and-play with the app is pretty straight forward and I’ve had fun playing against the AI opponents. I frequently lose the moment I step beyond Easy but that’s not a huge surprise – I like Istanbul but I’m not all that good at it! That said, in the physical form of the game I tend to realise how and why I lose, but against the AI losses have occasionally felt like they’ve come from nowhere. I suspect this is due to the increased speed of play. Turns with the AI fly by, not too quickly to miss what’s happening but you don’t get the same amount of downtime to ponder what’s next and really understand what they’re up to. I could always take more time on my turn but it’s a forced process instead of one that happens naturally. The online experience is pretty easy to navigate too. Most open games are played asynchronously, with players or friends around the world taking their turns when it’s convenient. It’s quite a relaxing way of playing and that replay function helps to keep your train of thought when turns are spaced out over hours. There’s always been a game available to join whenever I’ve gone into the online section and it’s simple to set up your own game. I will say that I have experienced a glitch online on one occasion, but that was the only time in a dozen games or so and it was right at the very start of the game so nothing important was lost. Otherwise the online games feel more meaningful compared to the AI on those occasions when there’s no one to pass-and-play with. In terms of transposing the physical version into the digital I’d say this is a huge success. I feel with the app like I’m playing the board game, I get the same level of satisfaction and pleasure out of stringing movements together and whilst I miss the tactile element, I very much enjoy the lack of set up and take down time. The AI system offers a chance to practice your skills and the online experience gives you meaningful opponents when there’s no one sitting next to you to pass to. Acram Digital have done an excellent job. Yet… app versions of board games can do more than just replicate their ancestors, and most versions I have tried have included something in addition. Perhaps my expectations are too high but once I’d played a few games I was left wondering is that it? 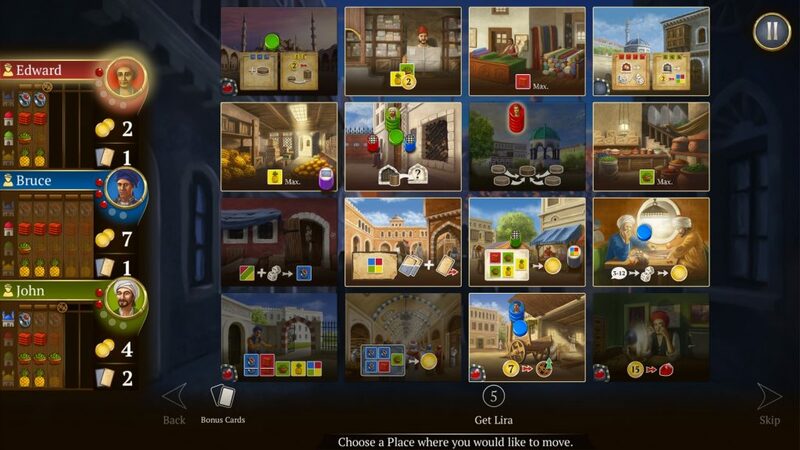 Compared to the plethora of options in the Jaipur app, for example, the welcome page of Istanbul seems a little lacking with only three main options – New Game, Continue Game and Online Game. Let’s be clear here, Istanbul: Digital Edition is an exceptional conversion. But I would have liked to have seen some challenges or even a campaign mode, something that uses the Istanbul framework to give the player some focus or direction. There are Achievements – visit a location a certain number of times, win a game by a certain margin, etc. – but these burble along in the background without you paying much attention to them. Unlike David McMillan who enjoyed the Achievement system in the Carcassonne app, I can’t say they do much for me. They expect the player to search them out and then remember them whilst playing and they don’t feel like they’ve been specifically designed as puzzles for the player, more a list of extremes you might do by accident. The original game’s expansions would also be great to include as additional purchases and I’d happily pay to experience them in the app. There’s the scope for these further developments and I hope they’ll come as the app develops, but at the moment the potential I can feel for the app remains out of reach. In summary then, Istanbul: Digital Edition is a great conversion. Acram Digital have effectively replicated the experience, making it as enjoyable and easy as possible. Any disappointment I feel is because I’d like to see them build on their hard work to create something special, to not be constrained by simply replicating. 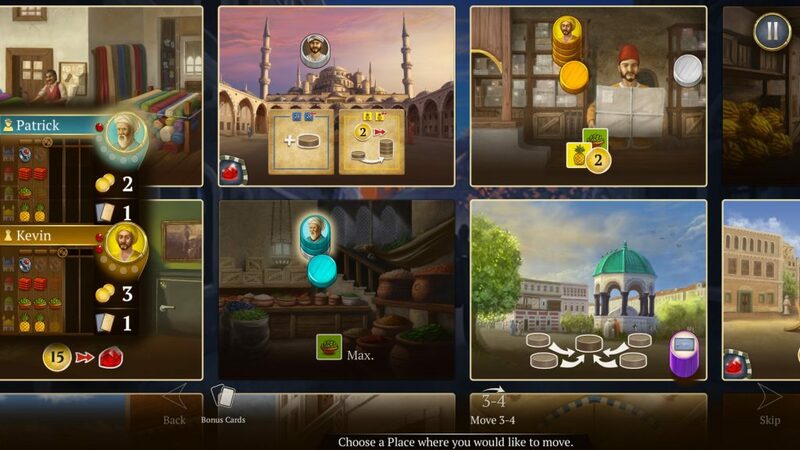 I won’t be getting rid of my physical copy of the game, but Istanbul: Digital Edition is a fantastic substitute for the far more frequent moments when playing the physical game isn’t possible. Next postBandido Review – It’s a Game About Tunnels, Ya Dig?